At Lightly Treading we bring a unique perspective to the evaluation of commercial and multifamily buildings. Our comprehensive approach to evaluating commercial and multifamily spaces, using diagnostic equipment and building science, allows us to find complete, honest solutions for true whole-building performance enhancement. Energy benchmarking is a rating system (through ENERGY STAR's Portfolio Manager tool), like miles per gallon, that allows us to make “apples to apples” comparisons amongst buildings. We also run preliminary diagnostics such as infrared scan visual inspections to reveal issues with insulation, lighting, HVAC controls, and more. Benchmarking the energy performance of a buildings is the first step to understanding and reducing energy consumption because you can’t manage what you don’t measure. For those of you who currently own commerical or multifamily buildings in Denver, the City and County of Denver are now requiring benchmarking of utility bills for buildings that are 25,000 square feet and larger by June 1, 2018. Click "More Info" to see specific deadlines and information on the Energize Denver ordinance. Contact us to get your building benchmarked ASAP. Building Science based inspections and tests which will identify where your building is losing energy, and the reasons for comfort problems, while quantifying the resulting savings (in a Level III audit) with an unbiased set of recommended improvements to optimize your buildings performance. Click below to learn more. Did you get what you paid for with your efficiency improvements? Take the stress out of wondering if your improvement contractor installed everything you paid for. Lightly Treading can complete a Post Improvement Inspection on your project to verify the work was completed as stated and provide you the peace of mind that your efficiency investments will pay off. For a fraction of the investment you made in efficiency retrofits you can be assured your investment was sound.In our post improvement inspection we will review the scope of work provided by your contractor and inspect your project to ensure it meets expectations. The details of our inspection will vary based on the work you had completed but may include: measuring insulation, performing blower door tests to determine air leakage, use of the infrared camera to assess insulation and air sealing work, and more. Click the button below to move beyond a stand-alone Energy Audit to a comprehensive service which begins with a no-cost 1 hour Assessment of your building to identify low-hanging fruit opportunities to improve the performance of your building, B) Benchmarking of your utility and water bills to learn how your usage compares with others across the U.S. and C) Consulting only on what you need. Whether it is an Xcel Energy basic audit, an ASHRAE energy audit plus modeling to fully quantify your potential energy savings or having us deliver Project Management of comprehensive energy and water savings improvements made to your building(s). 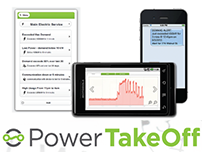 Power TakeOff delivers Powerful energy management reporting and monitoring solutions for you business.